Get choco farm items starting @ Rs.270 at Dilocious. Use coupon code to avail this offer. Give us your email so we can send you Sweets Coupons once a day and our biweekly newsletter. If you want to buy sweets for any occasion, you can get the best quality sweets online. You can use the sweets coupons available here to get your order more cheap and lower than your budget. There are plenty of online sweets stores from where you can place your order for your choice of sweets. A huge variety is available online like desserts, chocolates, milk sweets, various ice creams, etc and also you can buy them from popular brands like Baskin Robins, Haldirams, Kanti Sweets, etc. There are a lot of online stores to buy sweets and sweet hampers online for various occasions. You can buy sweets online for Diwali, Dussehra, and other important festivals, to make the occasion for joyful and sweet. 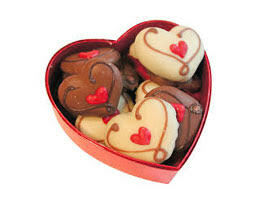 Popular stores to buy sweets online include Giftalove, IndiaFlowerMall, BookMyFlowers, Flaberry, Ferns And Petals, etc. All you need to do is to place your order at online stores that sell sweets and you can enjoy yummy homemade sweets in pure ghee to the ones that are from popular brands. These sweets are sometimes pricey during festivals and so you can save money by using sweets coupons from here while making your payment to save on your budget.